They targeted her mother too. Song Hye Kyo and her mother were revealed to have been blackmailed and threatened by someone she had worked with. 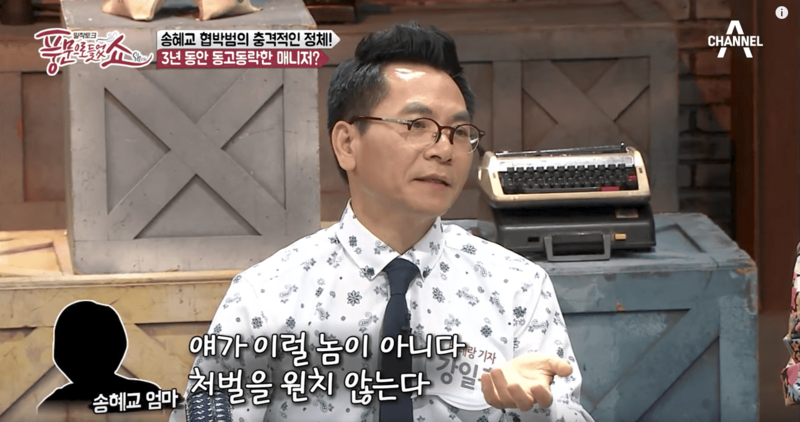 In a recent episode of Channel A’s Poongmon Show, it was revealed that Song Hye Kyo’s mother had received a letter in January 2005, blackmailing her for ₩250 million KRW (approximately $234,000 USD). The letter claimed that the blackmailer had prepared large vats of hydrochloric acid and hallucinogens to pour on their bodies if they didn’t send him the money. Upon receiving the letter, Song Hye Kyo’s mother immediately moved Song Hye Kyo from her house to a different location and reported it to the police. Following a police investigation, it was discovered that the blackmailer was her previous manager – whom she lived with for three years. According to police reports, Song Hye Kyo’s mother wailed uncontrollably upon finding out who the blackmailer was. The panel members also couldn’t hide their shock, especially because actors and actresses usually consider their manager as family and often spend all of their time working around them. Despite the previous manager’s threats and blackmail, Song Hye Kyo’s mother expressed that she didn’t want to press charges because she believed he would never have done such a thing. Song Hye Kyo’s previous manager was let go from the agency for not reporting the commission he earned from her photo shoots and spending it randomly. After he was laid off, he struggled financially and moved around, sleeping at various public baths. During his struggles, he claimed he thought of Song Hye Kyo and how well she was doing, and resorted to blackmailing and threatening her and her family for money. Why Do The Electronics Of The Girls In Jay Park's Videos Always Run Out Of Batteries?